The Pourty Easy-to-Pour Potty has a unique duct and anti-drip lip making it easier to clean than a conventional potty. The bristles are soft and soothing yet firm enough to massage the cradle cap away in a safe and kind way. The Flexi-Fit has a unique squeeze flex action and adjustable prongs so that it fits securely to most shapes and sizes of toilet seat. A taller non-slip step that makes it easier for a child to get on and off the toilet and easier to reach the taps. Here we are again in the press. 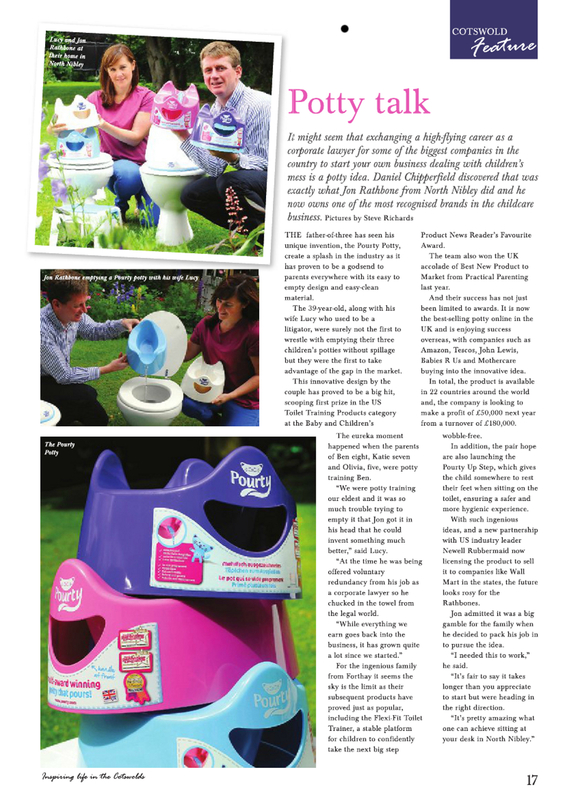 Who would have thought a potty company would be regarded as an “Essence of the Cotswolds”! Joking aside, we do feel very lucky to live in such a beautiful part of the UK. It’s interesting that a high proportion of people who live in our village are entrepeneurs running their own businesses from home. Perhaps the reality of the daily commute in rush hour pushes folk to be creative and think of alternative ways to earn a crust. It is a struggle in these difficult economic times but there is a quality of life trade off that always eases that pain, particularly at this time of year. It would be such a shame to miss the Greatest Show on Earth – the Nativity play! That said, whenever I go back to my native Bristol I shed a little tear of mourning for my previous life. Imagine being able to pop to the corner shop for a pint of milk – I can only dream! Grass is greener and all that….. In other news, I’m pleased to report that Pourty is going from strength to strength and is growing rapidly year on year. In 2014 we will be adding to our bathroom range with 2 new innovative products. Exciting times!! Amazing!! Overnight she would get onto the toilet on her own and happily go about her business. You can see that she is comfortable and there is no chance of an accident as the front piece of the Flexi-Fit Toilet Trainer helps her position herself just right. I was really pleased with how secure it feels when attached to the toilet seat and my daughter was very happy to sit on it because it doesn’t wobble about and she finds it comfortable. Having used another toilet seat for my son 3 years ago, I definitely prefer this one because it makes your child feel so much more secure. 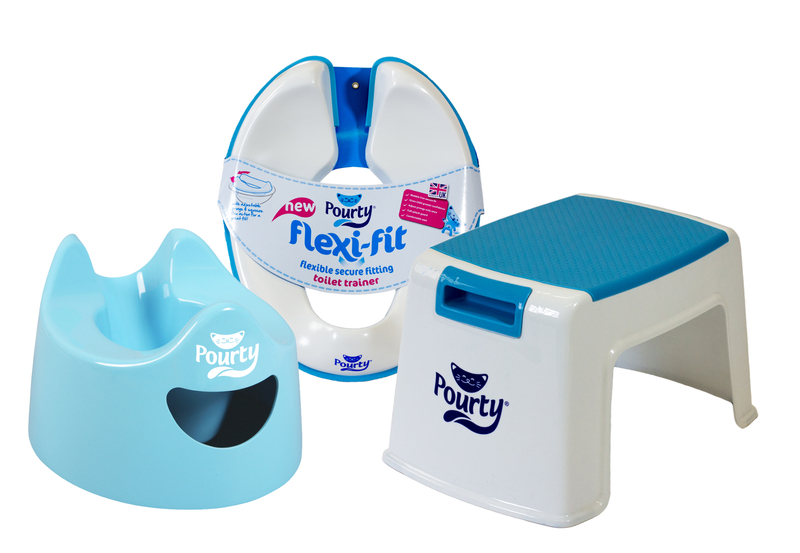 The Flexi-Fit is designed to improve the standard toilet training seat and make life easier for parents…..The seat comes with two adjustable prongs which…attached perfectly and didn’t wobble we were able to take it off pretty easy too. Its really handy when it comes to moving it from toilet to toilet. My boy loves his Pourty toilet training seat. He can now climb onto the toilet himself (by holding onto the radiator and using a step) and get down too. This is adding to his sense of independence and I’m amazed at how far he has come in the few short weeks since I was pulling my hair out at the constant accidents. I really liked the Pourty. It was easy to install, the directions are great and even has pictures to help. My son enjoyed using it he always has to hold himself up over the toilet but with the Pourty he could easily sit and be comfortable. I think this is a must have for parents who are potty training. This is an awesome addition for families who use and love the Pourty Potty. The seat topper fits on most toilet seats and has prongs to stay in place. Children familiar with the Pourty Potty will feel comfortable. The seat also has a gap in the backrest to help children have easy access to wipe. Fantastic! It was really simple to attach and secure to the toilet seat, and adjusted to both our toilet seats in the house. It stays in place and doesn’t move at all. This is by far the most secure toilet training seat. My daughter didn’t wobble or need to hold onto the sides to steady herself. She felt confident climbing onto a step to get to the seat by herself as the seat stayed firmly in place. It is easy to remove too; I just had to squeeze the back together and make sure the prongs were out from under the standard toilet seat.